The choroid is the layer around the back part of the eye between the retina and the sclera. The choroid tissue has the highest concentration of blood flow in the body. (pigment) producing cells located in the choroid layer of the back of the eye. Choroidal nevi are relatively common and occur in approximately 6.5% of the Caucasian population and about 3-4% of the general population. Choroidal melanoma is more common in whites than in other races. Whites are 500% more likely to have melanoma than African-Americans and three times more likely than Asians to have choroidal nevi. The majority of choroidal melanoma patients are over the age of 50. The risk of having a choroidal nevus is that it may possibly change into a malignant choroidal melanoma. A choroidal melanoma is the most common primary intraocular malignant tumor and it is potentially sight threatening and lethal. In most cases, there are no signs and symptoms of a benign choroidal nevus. A choroidal nevus is discovered only through a comprehensive eye exam often requiring dilated pupils. Only an eye doctor using specialized instruments can diagnose and monitor a choroidal nevus. If a choroidal nevus worsens and begins to leak fluid or if abnormal blood vessels develop, it is possible to then have a retinal detachment or degeneration in the area leading to some visual loss symptoms or flashing lights. Although the exact cause is not known, it is believed that either from exposure to UV-B radiation or other causes, an increased production of melanin caused by DNA photodamage to the melanocytes causes excess melanin to be deposited in the choroidal tissue. A typical choroidal nevus usually does not require any treatment. However, it is important that the patient be evaluated at least once a year. 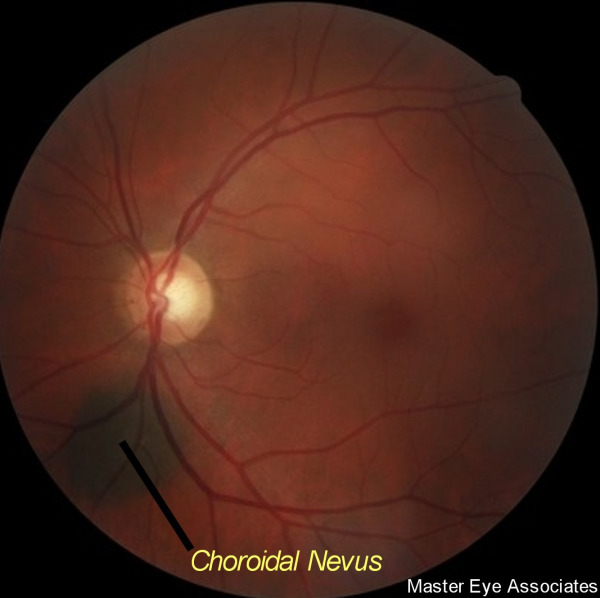 The choroidal nevus is particularly large (greater than twice the size of the optic nerve head). The larger the lesion, the more likely it is to be malignant. Thicker than normal in the affected choroid area. Orange pigment (lipofuscin) on or around the nevus. If any of the above are present, the choroidal nevus is more likely to grow into a choroidal melanoma or possibly already be a malignant choroidal melanoma. Your eye doctor will decide how often to re-check your nevus to decide if it has grown into a melanoma. In most cases management of a choroidal nevus should consist of retinal photography and ocular coherence tomography (OCT) and possibly laser autofluorescence testing. It is important to note that on follow-up care of a choroidal nevus that the illumination level of the special retinal camera be the same to compare to previous photos. Brighter illumination of the retinal camera makes the choroidal nevus appear smaller and vice-versa. Large or thick nevi or those with orange pigment on the nevus or those leaking fluid should also have ultrasound B-scans and possibly fluorescein angiography. Retinal photography with a sophisticated instrument allows for viewing the major layers of the retina and the choroid. The doctor can then be assured that the nevus is isolated to only the choroid and has not spread into the retinal layers. If the choroidal nevus prevents the eye from removing retinal waste products, drusen can develop on the surface. The drusen appear as yellow-white spots on the surface of the choroidal nevus. It typically takes many years for drusen to develop. A typical, small choroidal nevus is a benign condition and must simply be monitored to be sure it does not change into a malignant choroidal melanoma. The odds of a choroidal nevus evolving into a melanoma have been reported in the literature everywhere from one out of 8,500 to twenty-one out of 100,000. Sunglasses to prevent choroidal melanoma? There is a higher incidence of choroidal melanoma in people with blue eyes and people that work outdoors. Although there is no absolute definitive proof that choroidal nevi are caused by exposure to sun, most eye doctors would recommend use of quality sunglasses that filter UV radiation to minimize the effects of the ultraviolet radiation on the eye.